We're sorry but this "new car" set to be introduced by the General at the Chicago Auto Show next week doesn't excite us in the least. We went back and forth as to whether we'd even bother showing you this new variant-edition Hummer that apparently has only one thing that sets it apart from other option-packed H2's and H2 SUT's on dealer lots — it's got a new and angry color called "Victory Red." General Motors, meet me over at camera three. OK, guys — seriously — WTF? I know that technically you can call any change you've made to a production model a "variant" but for real, this is the Cavalier Z24 of the Hummer brand — minus the performance. 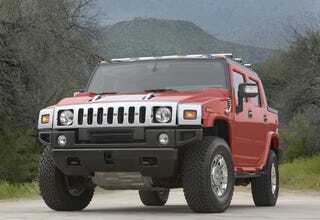 In fact, let's make a game of this — we've got a gallery below of GM PR pics and a link to the official Hummer H2 site. Try and find the differences. We'll post the press release with the official "new hotness" later this evening.